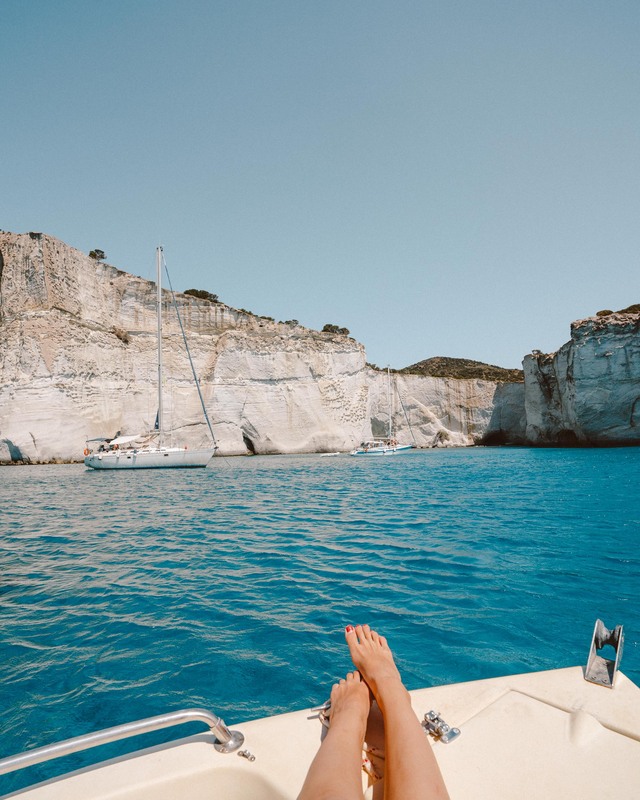 I can confidently say Milos, Greece is one of my favorite destinations to date. 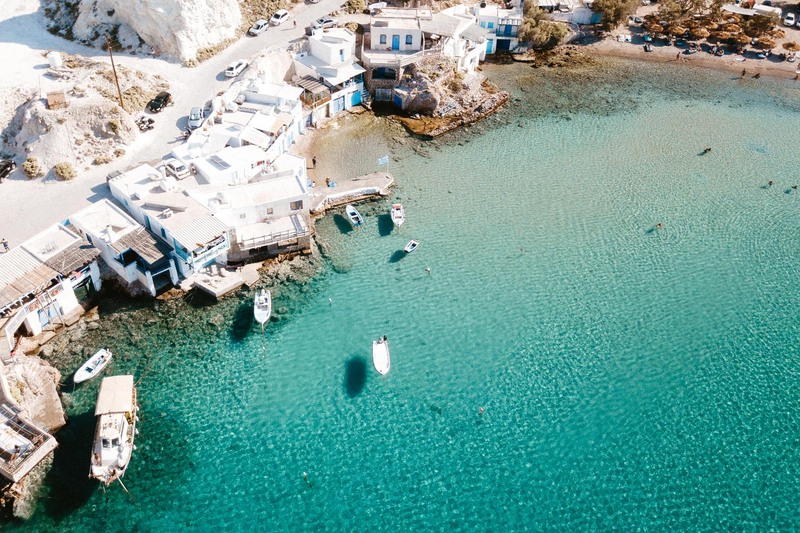 Between the unforgettable beaches (if you haven’t seen photos of the ‘moonscapes’ of Sarakiniko Beach, check them out ASAP), delicious fresh seafood, and quaint and uncrowded downtowns, it’s truly a slice of paradise. 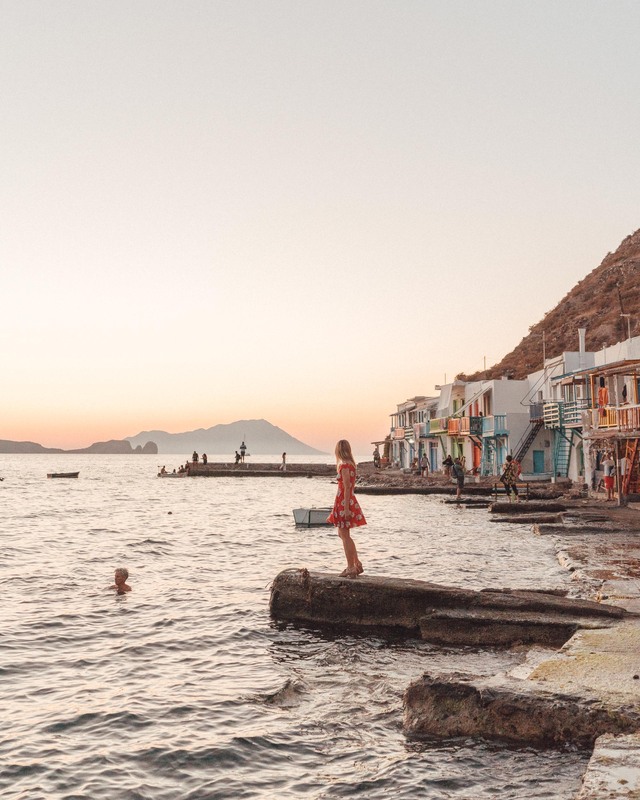 Milos has a port that connects directly from Athens so it’s the perfect jumping off point to spend a summer Greek Island hopping. 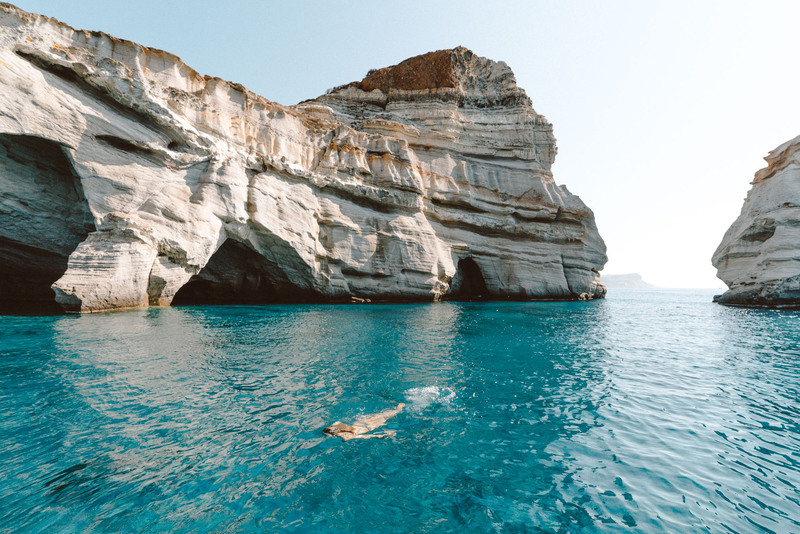 We took a ferry directly from Athens to Milos, with a few stops on the way. It took just under 5 hours for us to arrive at Milos’ port and then hail a taxi for a short drive to our hotel. The best way to experience the Greek Islands (especially Milos and Santorini) is by ATV or motorcycle. We opted for ATVs this time around, and ours was already at the hotel waiting for us when we arrived. That’s about all you need for the island to be yours to explore! Our first priority was heading straight to the beach, then off to grab a Greek dinner downtown. 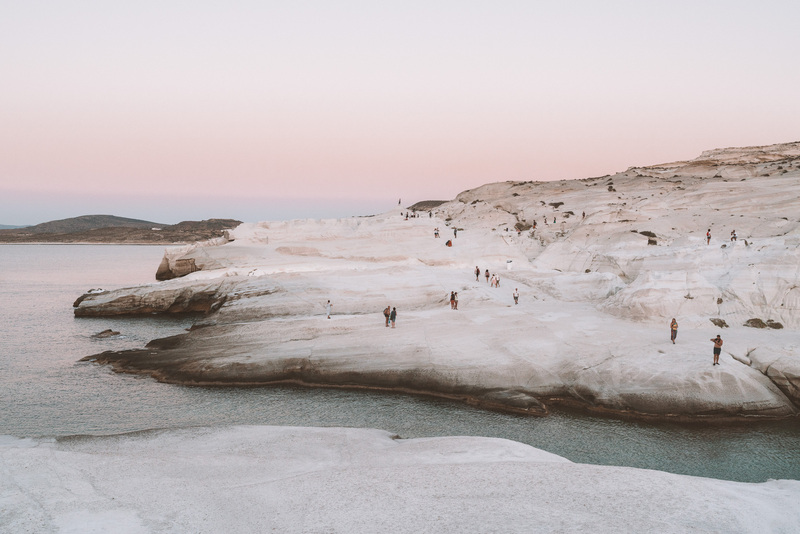 Unlike most places, you don’t need to have a schedule upon arrival to Milos. I’d recommend having a few places in mind that you want to hit – beaches, towns, and restaurants. Typically our routine here was: sleep in, head to a beach, grab lunch, explore another beach, and then make our way home to get ready for dinner in town. 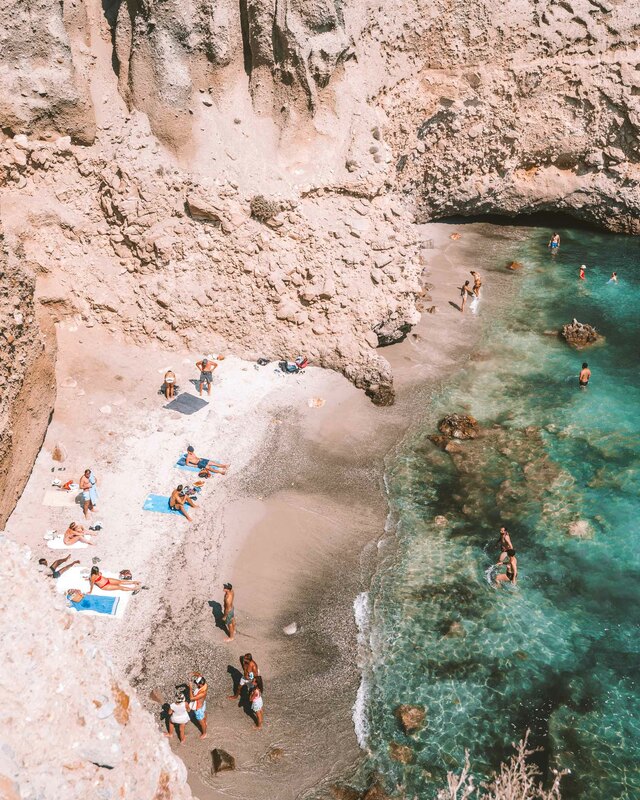 This Milos Travel Guide starts with some of our favorite spots around the island, then breaks down the beaches we loved. 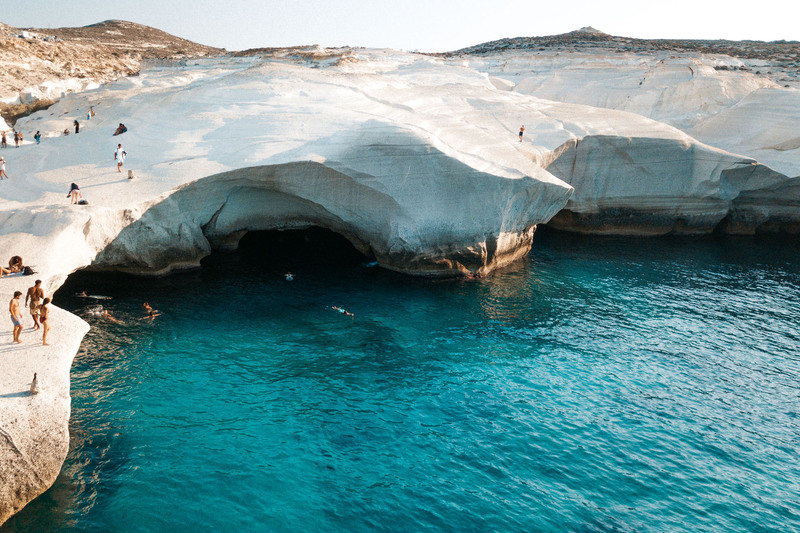 The only thing I found tough about Milos, Greece (besides the spotty WiFi!) was not knowing which beaches would have lunch nearby – so I made sure to include this so you can plan your day accordingly. Our hotel near Sarakiniko Beach: Asterias Boutique Hotel. 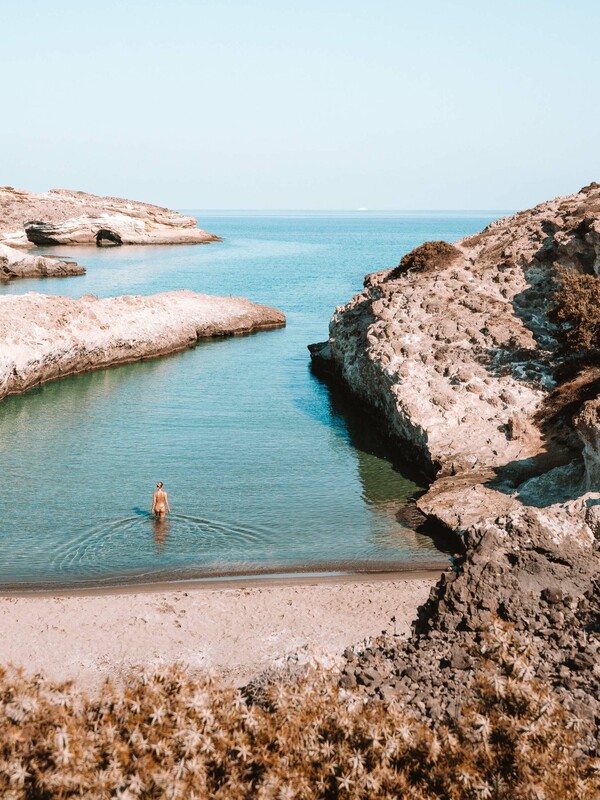 We stayed at Asterias Boutique Hotel, a family-run boutique hotel located between Sarakiniko beach and Papafragas beach – which turned out to be two of my favorite beaches on the island! Each night we’d take our ATV for a 15 minute drive into the seaside town of Pollonia to grab dinner. 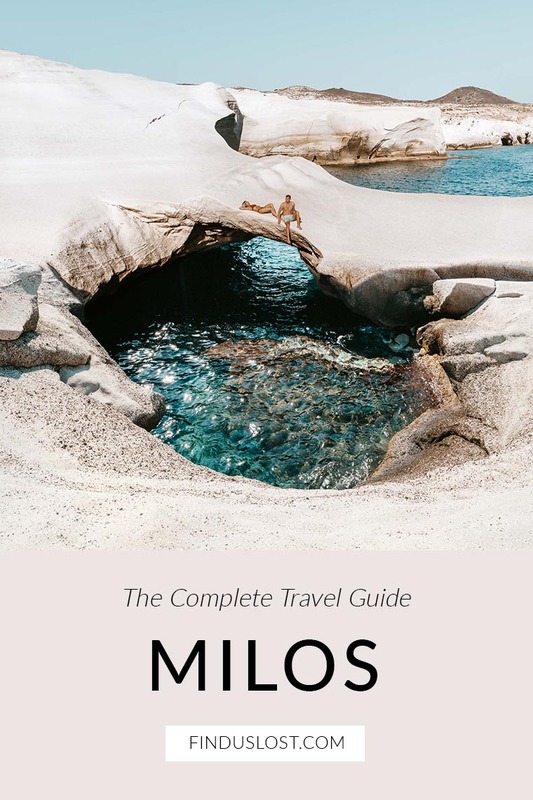 Note that Milos doesn’t have many hotels, so book months in advance as they fill up quickly. We originally had our eye on Melian Boutique Hotel in Pollonia, but it was fully booked during our visit in September. Asterias Boutique Hotel – we loved the location of this family-run boutique hotel. It was affordable, comfortable, and a perfect jumping off point to explore the island! Miland Suites – this collection of luxury villas is located on a hilltop close by to the main port town of Adamantas. Great if you want a quiet location, a short drive from local restaurants. 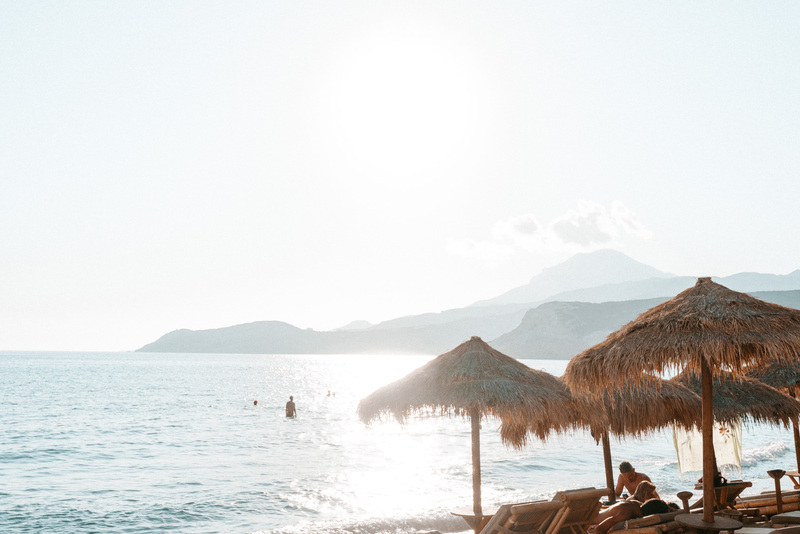 Milos Breeze Boutique Hotel – a mix of traditional architecture and modern design, this central hotel has a beautiful infinity pool overlooking the ocean. Located in Pollonia. Melian Boutique Hotel & Spa – one of the few luxury boutique hotels on the island – snap it up if it’s available during your trip! Milia Gi Suites – this newly built boutique hotel is located just outside the town center of Pollonia, a short walk to the beach. The rooms are spacious, some with private jacuzzis. Casa Ana With A Sea View – a modern, chic one-bedroom close to Plaka downtown. Blue Mare – a Greek beachfront home on one of my favorite beaches on the island. Venia’s Superior – a comfortable apartment-style building with a sea-view patio in the quaint town of Pollonia. 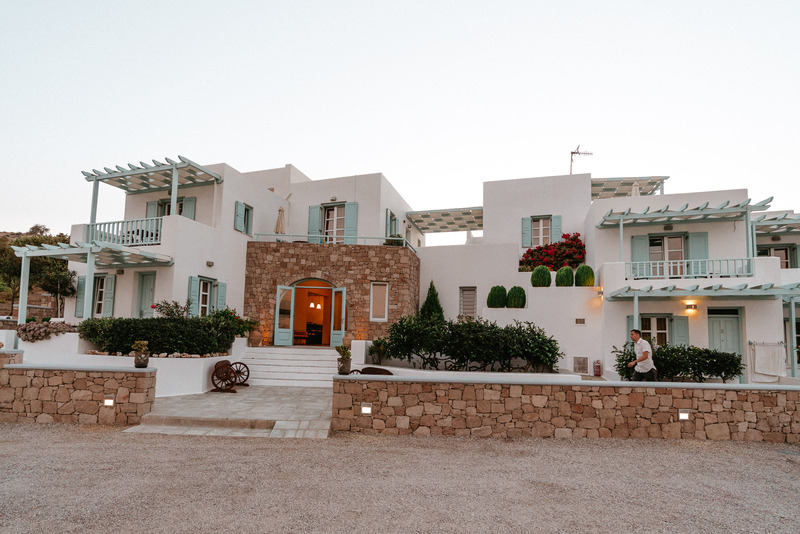 Apollon by Akropolon – one of the top-rated Airbnb’s in downtown Pollonia. Green Suite – an amazing whitewashed 2-bedroom property with a pool just outside of Pollonia. New to Airbnb? Here’s our code for $40 off your first booking! 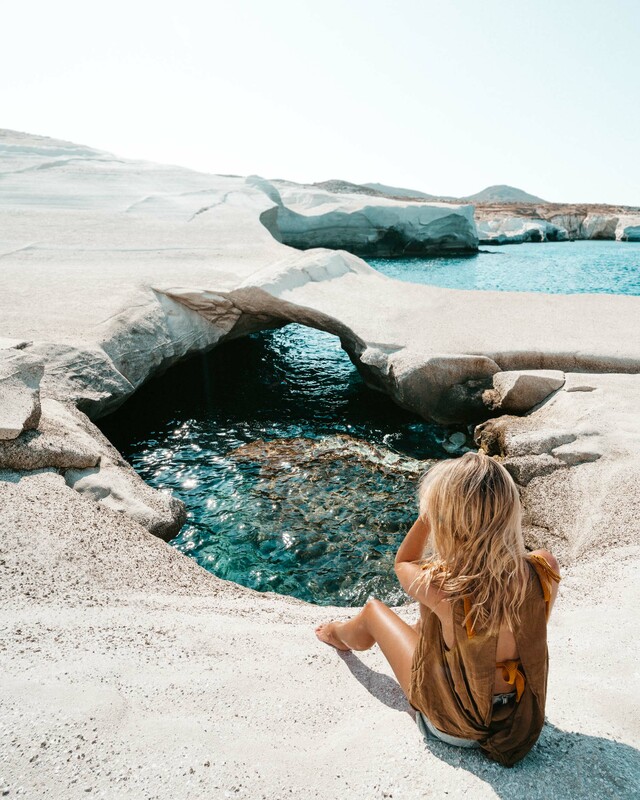 If I went back to Milos, I would split my time between a hotel and Airbnb on two different parts of the island. 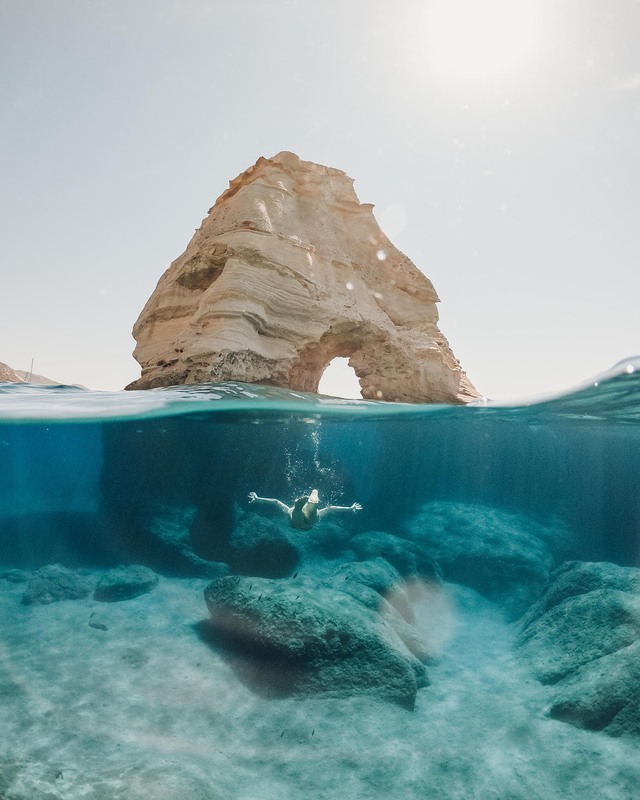 There is truly so much to discover, and having two points to explore from will give you a whole new perspective on the island! Plus, I love the homemade Greek breakfasts on the patio in the morning, which come with a family-run hotel like Asterias Boutique. Hanabi Sushi restaurant in downtown Pollonia. Medusa – this was easily our favorite meal on the island. 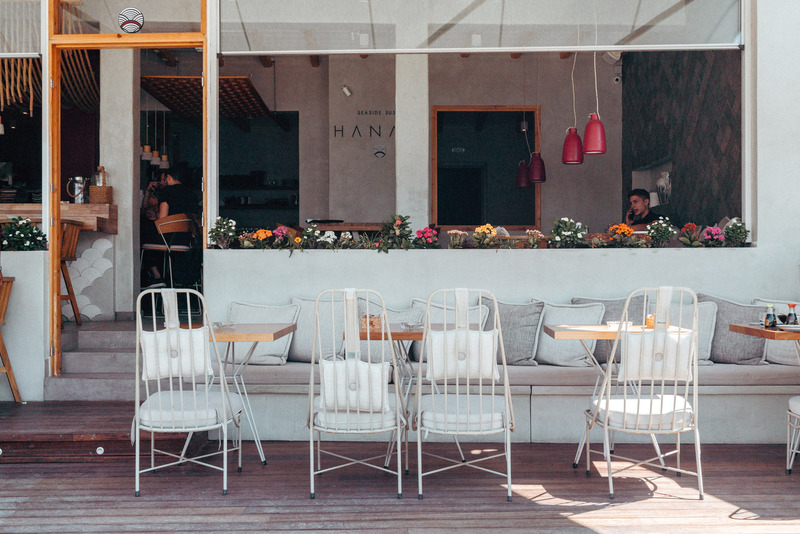 It’s located adjacent to Mandrakia beach, and serves up fresh fish right on the water. Be prepared for a short wait (it’s popular for a reason! ), and don’t miss the octopus. Jordan’s Meating Place – for melt-in-your-mouth chicken souvlaki (chicken skewers)! This restaurant is basic, but they don’t mess around. 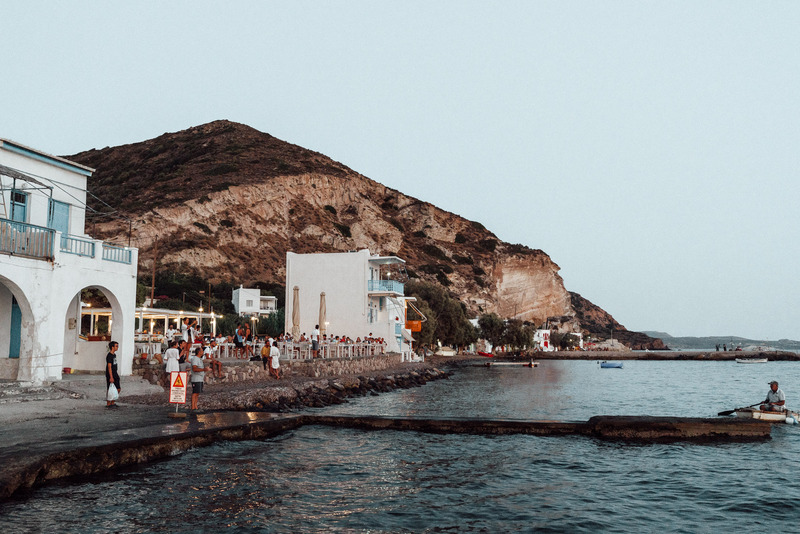 Astakas Klima – for an evening out, this waterfront restaurant is the perfect place to watch the sunset. 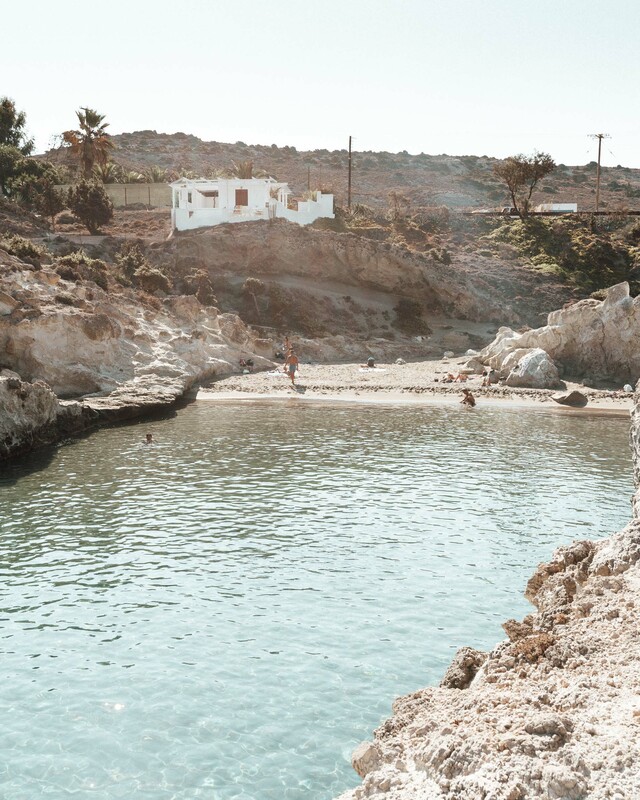 You’ll want to come early to explore the quaint town of Klima, a little fishing village. Reservations recommended. Ergina – recommended to us by a local, this Greek restaurant serves up amazing homemade pasta and lots of other Greek specialties. Perfect for a date night – make reservations. Hanabi Sushi – this sushi spot is on the pricier side, but we loved their rolls and location in downtown Pollonia. Perfect for a lazy afternoon lunch or a nice dinner. Avli-Milos – authentic Greek food in the heart of downtown Plaka. You can’t go wrong at this restaurant, with tables all along the side streets! Fatses – in terms of Greek food, this spot doesn’t quite hit the mark for the tastiest (or most traditional). However, in terms of atmosphere it can’t be beat. The patio takes over a main square in downtown Plaka, with string lights in the trees, candles, and live music. My tip: go early for a drink and appetizer, then make your way into town for round 2. Palaios Pastry – a MUST for dessert! Everything is homemade and the entire shop smells delicious. Don’t miss the orange cake with olive oil, it melts in your mouth. Views from our boat on our day trip to Kleftiko caves. 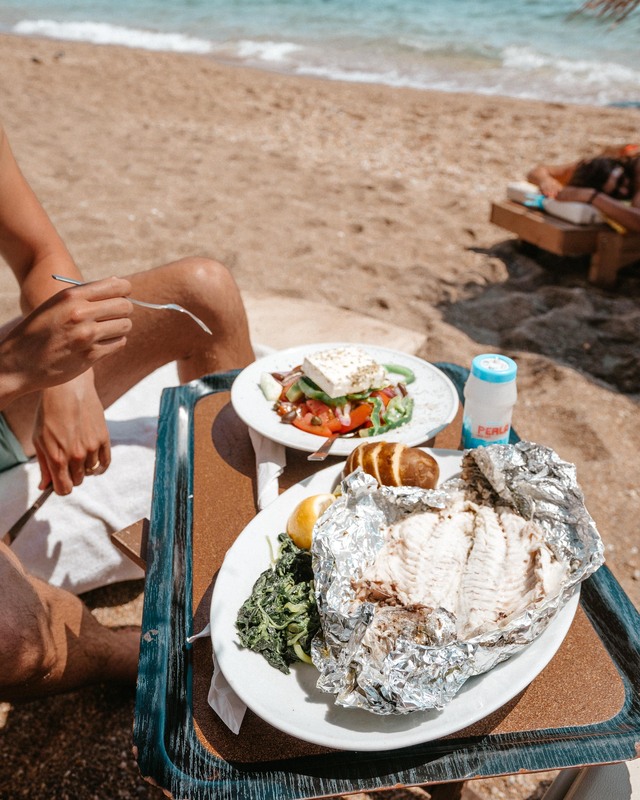 Try food cooked in the sand – Paliochori Beach is known for its red rock and sand that gets so hot…you can cook food on it! 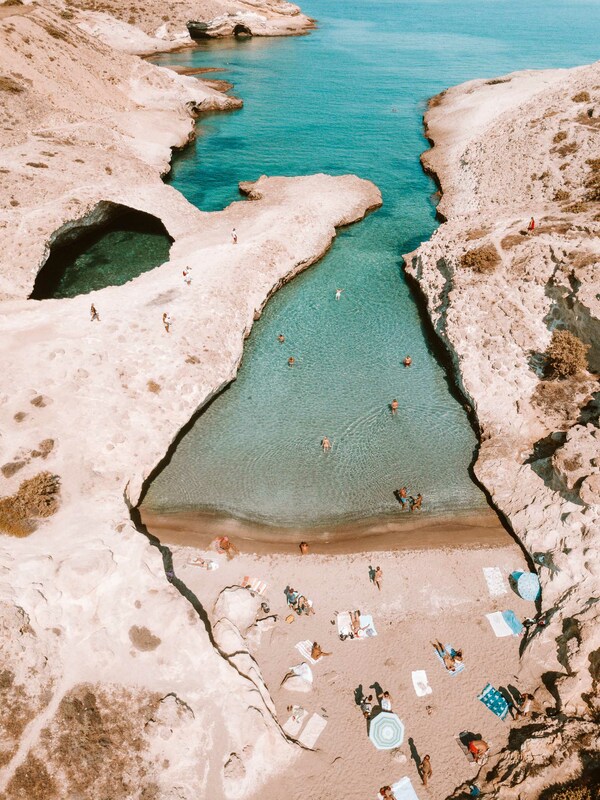 Don’t miss this unique beach. We ordered our food delivered to our lounge chair. Watch the sunset – we loved finding different spots around the island to catch the sunset. I included a list at the bottom of this post with photos of some of our favorites. I highly recommend exploring on your own though, you never know what views you’ll find! 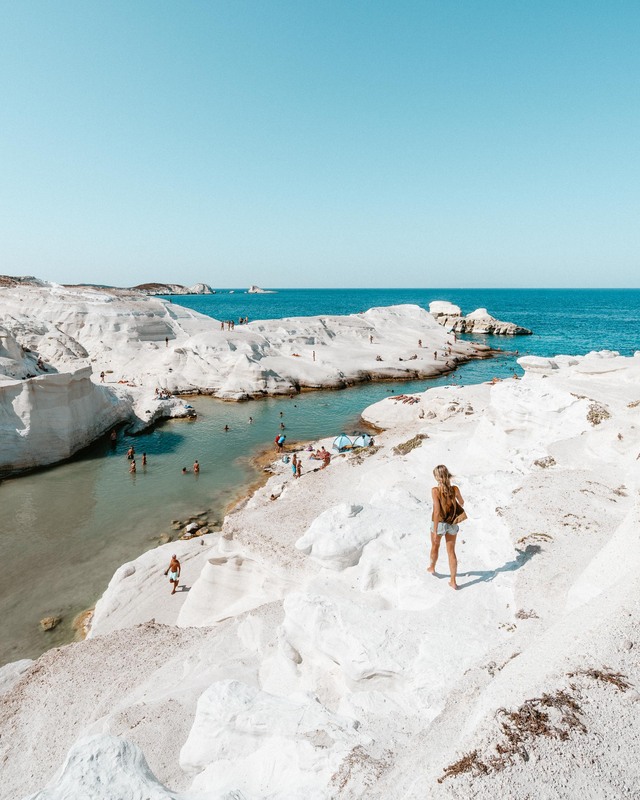 Visit the Catacombs of Milos – these preserved catacombs date back from the 1st – 5th century and are located nearby the fishing village of Klima. We didn’t get a chance to visit during our trip, but I’d love to see them if we return. Get lost on an ATV – there may be plenty on your list to explore, but spend at least one afternoon getting lost on the island. 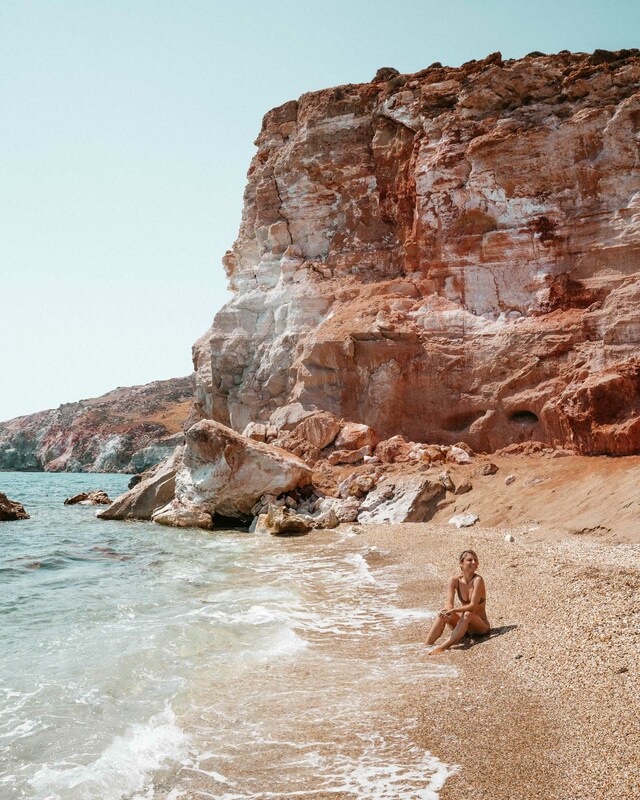 We stumbled on a deserted pebble beach with no one around whilst exploring the coastline. A unique beach made of lava that’s been bleached by the sun and sea. 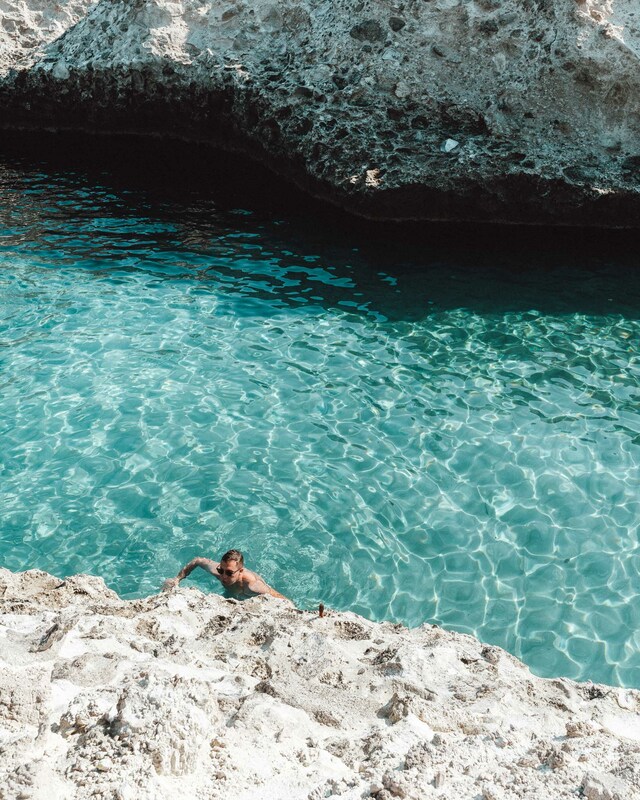 There is a sandy beach, cliff jumping spots, and a swimming hole open to the ocean. Food options nearby: only a local food truck at the entrance of the beach, so it’s not guaranteed. 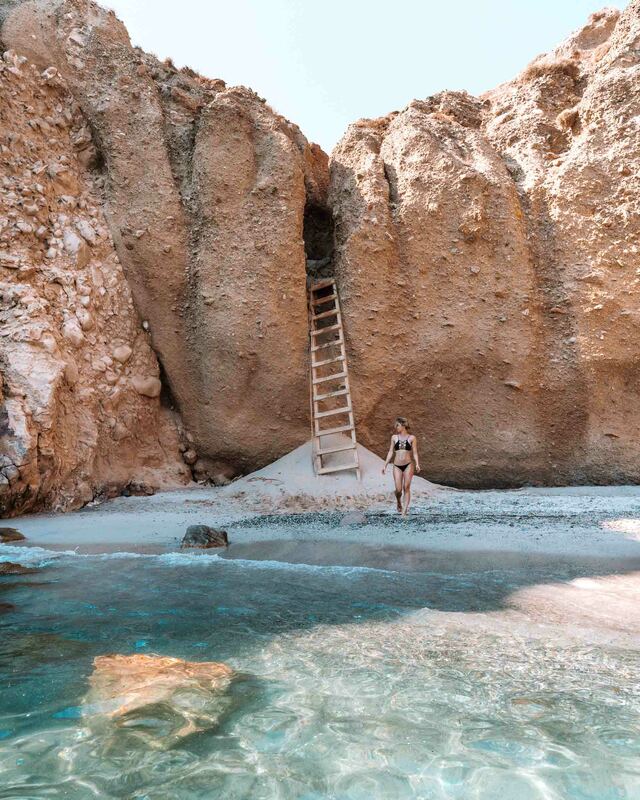 This small beach is only accessible via a steep set of two ladders, but opens out to turquoise blue water that’s perfect to wade in. 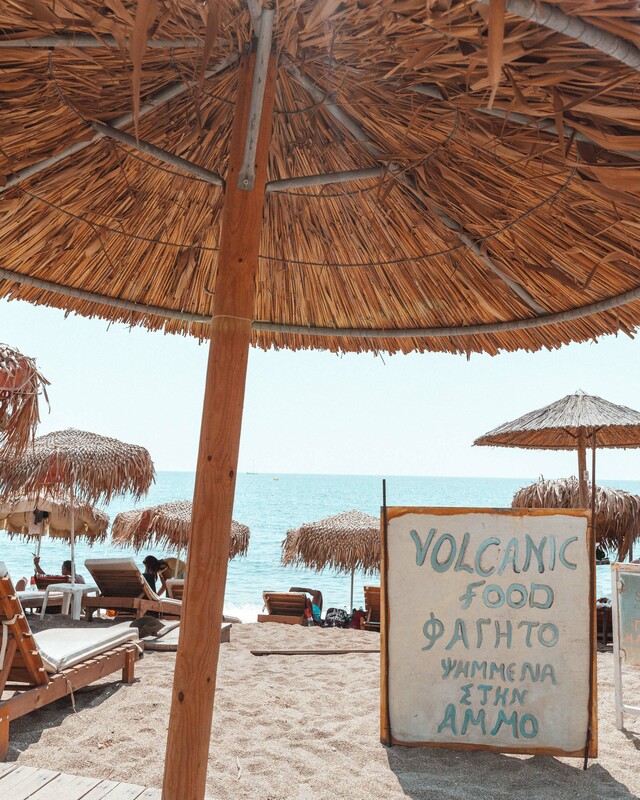 Food options nearby: there is nothing on Tsigrado Beach, but you’ll find drinks and snacks across the way at Firaplaka. It’s within walking distance. A long stretch of sand with beach snacks for food and drinks. 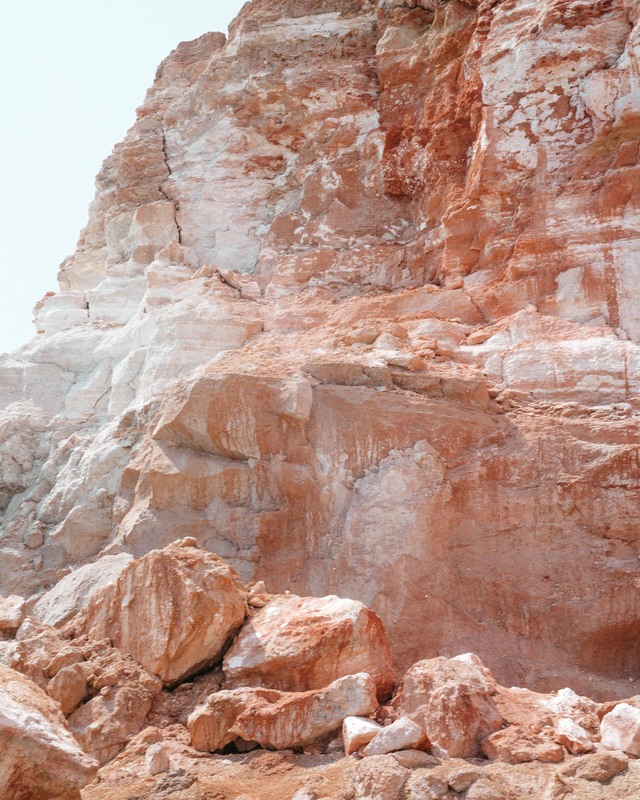 The rocks are a beautiful red color – not to be missed! Food options nearby: yes, there are food and drink options on the beach. This beach is actually made up of two ‘fingers’ of water that carved the rock out from the ocean, so be sure to check out both. Looking at a map, the left one features calm water and is easy to access just off the road. The right one is completely protected by walls and white-washed caves. Food options nearby: none. The closest place to grab lunch is downtown Pollonia. A pristine stretch of beach protected by the nearby cliffs. Known for its white-washed houses, and nearby cliff jumping spots. Food options nearby: Yes, there are food and drink options on the beach and nearby. Restaurants on this beach will cook your food on the sand! There are lounge chairs here, and it’s also the best beach to go to if it’s windy on the island. Food options nearby: Yes, there are restaurants and you can even order food straight to your lounge chair. 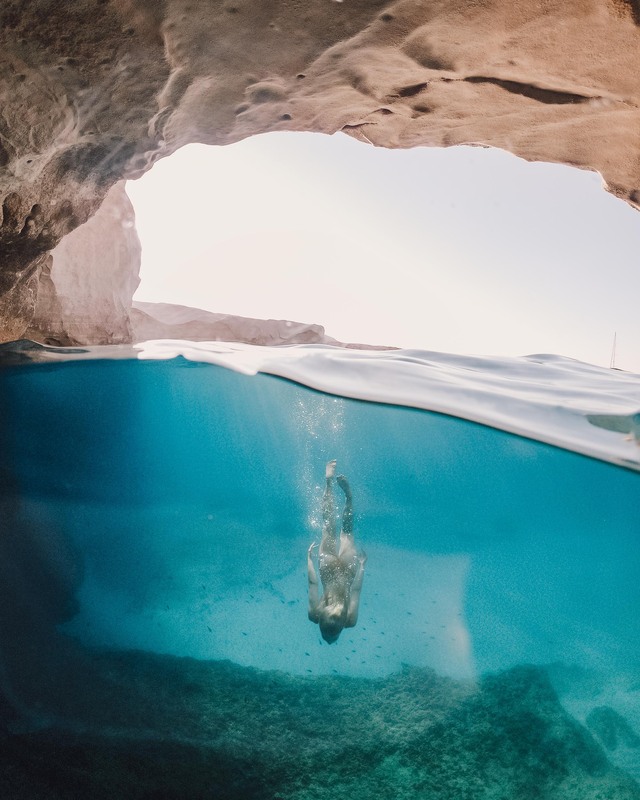 Not necessarily a beach, but rather a series of caves and lagoons off the coast of Milos. A must-visit for the perfect blue water and unique coastline! We hired our own boat through this website (it took us about 20 minutes to get to Kleftiko from the nearest beach). If you’d prefer not to seek it out yourself, I highly recommend booking a boat tour in advance as they fill up. There’s plenty of charter boat tours to choose from – I included some of the highest rated local ones below. Food options nearby: No, once you get there you can only drop anchor and there’s nowhere to dock. If you go with a boat company, many provide meals. Klima Village – this traditional fishing village features multicolored houses along the rocks, steps from the water. Few inhabitants still live here, but if you’re visiting around sunset, you might catch them going for an evening swim! I recommend catching the sunset first and then making your way to dinner nearby. Venetian Castle – one of the highest points on the island, this castle dates back to the 13th century and is still preserved. 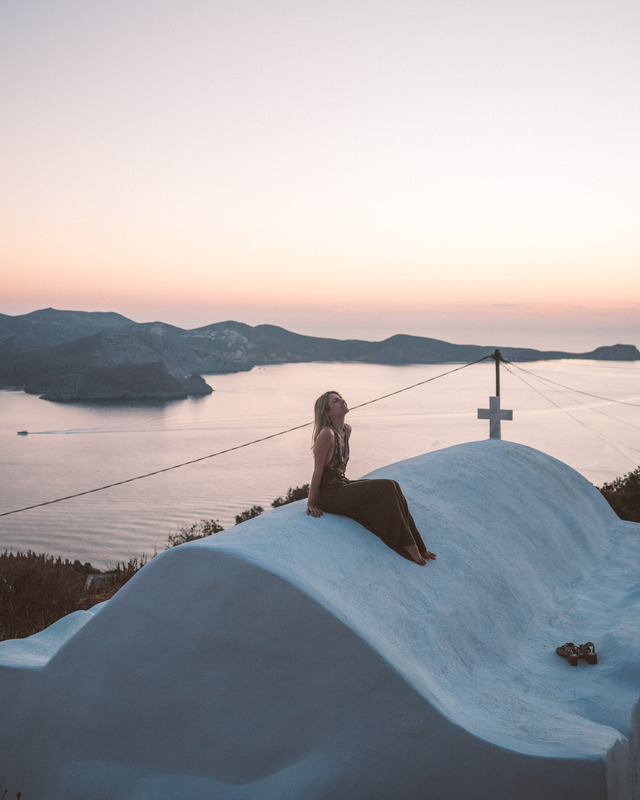 It offers panaromic views of the island, and is easily one of the best spots to catch the sunset – if you don’t mind climbing stairs! 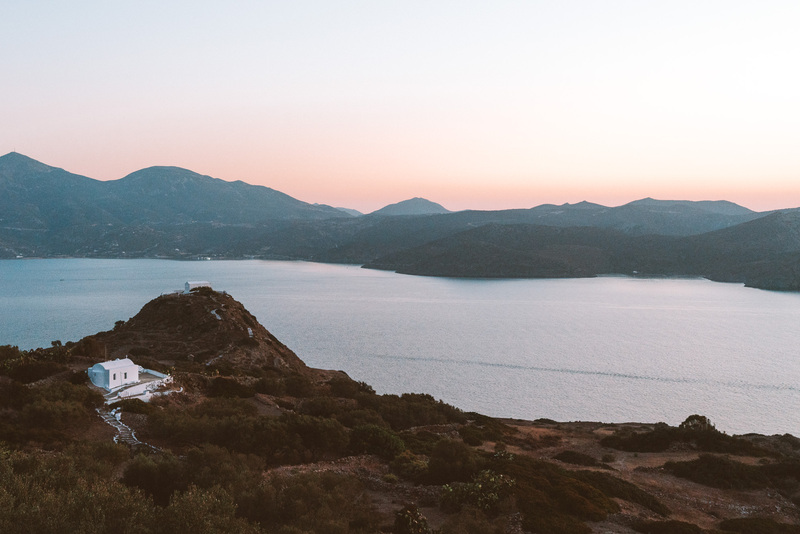 Try to arrive at least 20 minutes before sunset to snag a good spot, then head down the hill to Plaka for a Greek dinner in town. 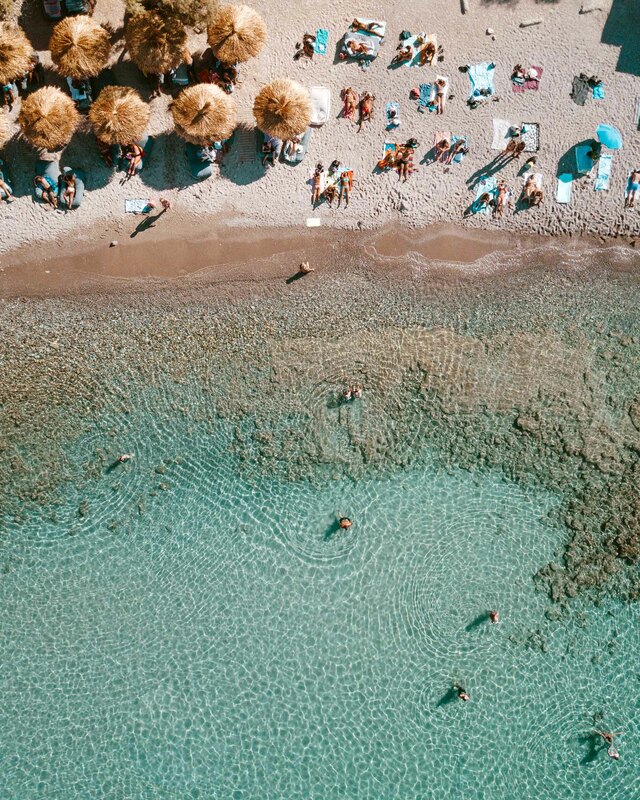 Sarakiniko Beach – we visited this beach so many times during our stay, and each time it was a different experience. It is fairly empty at sunrise, and you’ll likely only see a handful of other people around. The water is a perfect turquoise mid-day, and at sunset the sky tends to turn into a pink-purple haze. It’s a surreal experience – I highly recommend watching the sunset from here at least once during your visit. From the road – you could search all around the island, but sometimes the best spots are just off the road during a drive home at sunset. 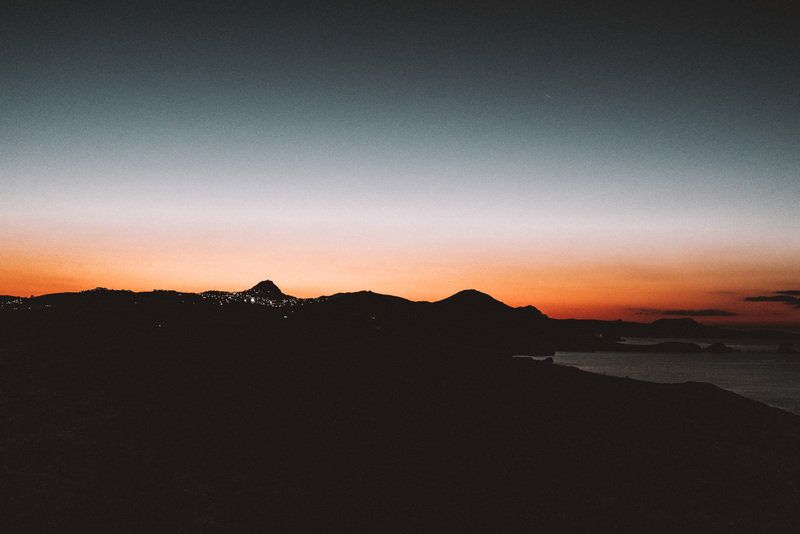 We captured this moment after the sun went down over Plaka, during a late trip home from the beach. 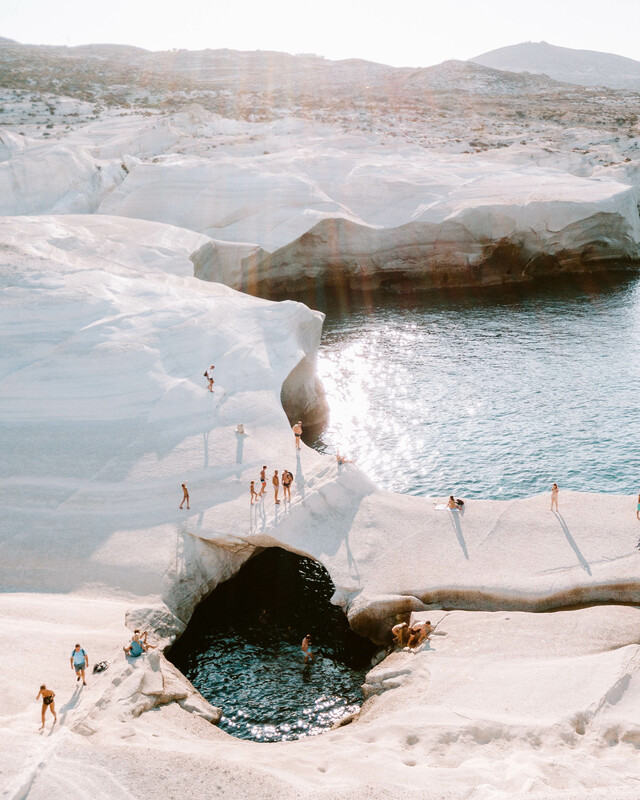 Milos is just stunning! Thank you so much Ana! I love hearing that! Hope you had the best time in Slovenia and Hungary – we loved both countries so much. oh wow this place looks absolutely beautiful! 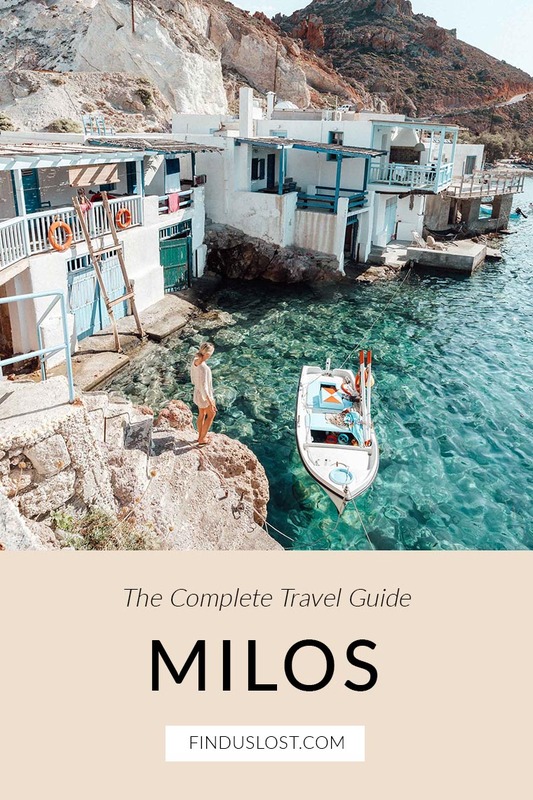 Thanks for sahring all this info – Milos is now on my bucket list! I went to Greece in the summer and loved it but holy moly this is next level amazing. 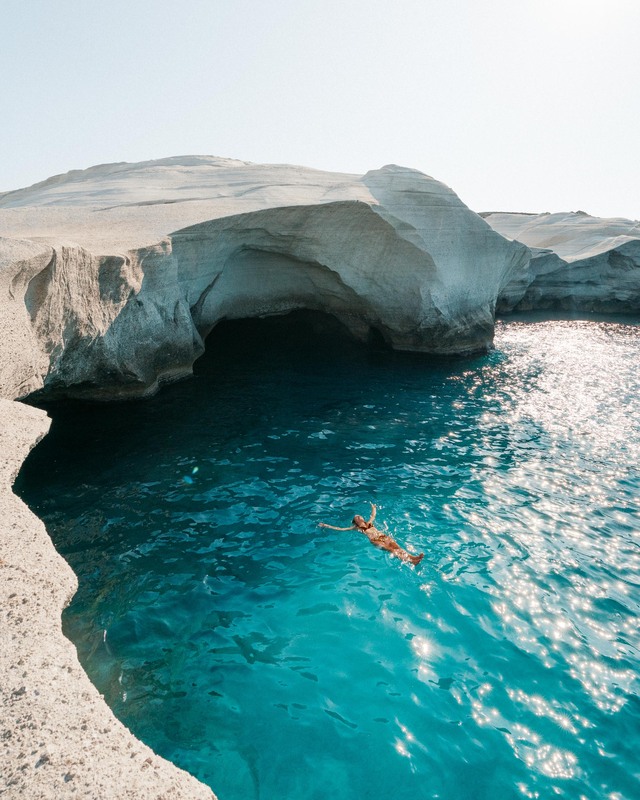 I will have to put Milos on my bucket list. I am going to the states this May-June and I’ve already got my travel bug on. I can’t wait to read your guides and see what other places I have to go to! 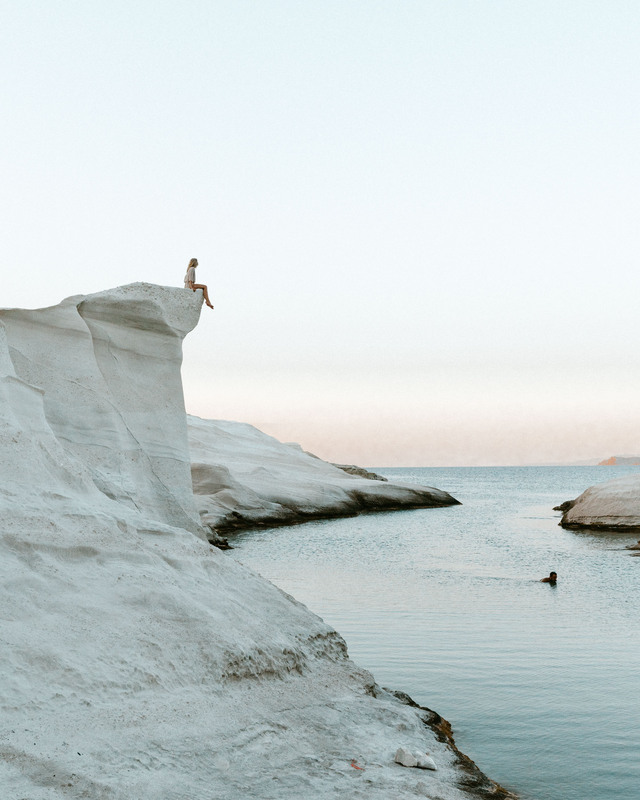 It makes one yearn to go over to Milos wherever they are right now. 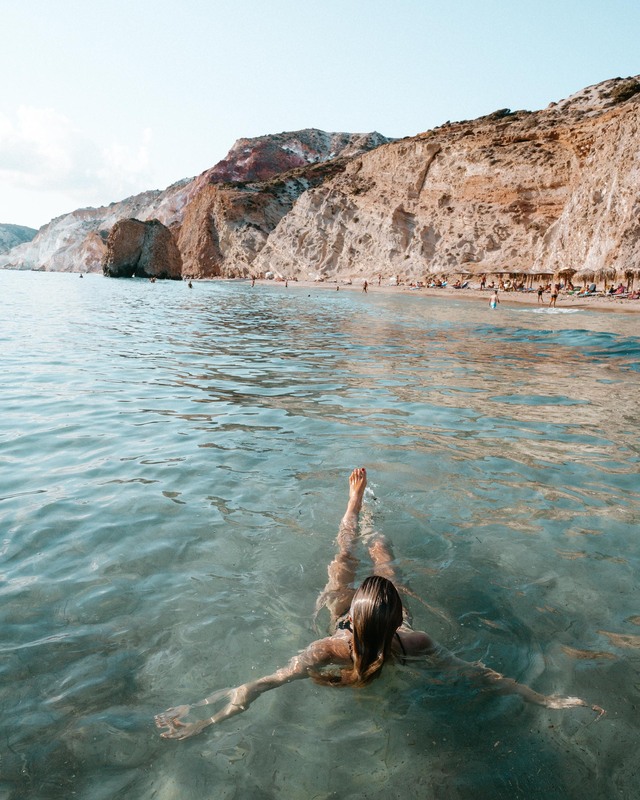 When I was in Greece I went to Athens, the sceneries, beaches and all you described are worth every penny. 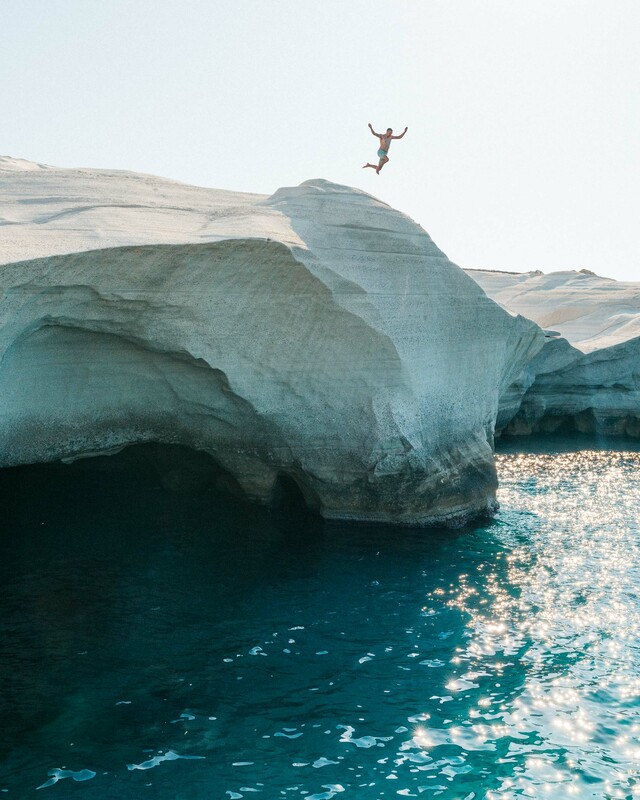 There is so much to experience in Milos,now I know. Hi Selena, I love your instagram and blog so much, I check in every day to see your posts. I have gotten so much inspiration from you! My husband and I travel quite a bit and typically prefer to stay in one destination for an extended time rather than rush many destinations. 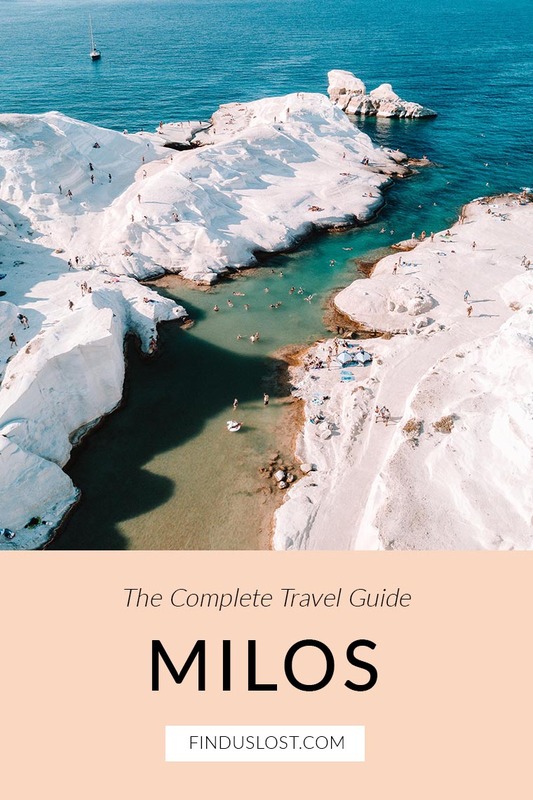 We have 8 days to spend in the Greek islands and I can’t decide if we should spend the whole week in Milos or split it and do 4 nights each in Milos and then Naxos. Any advice? And this is a tough one. 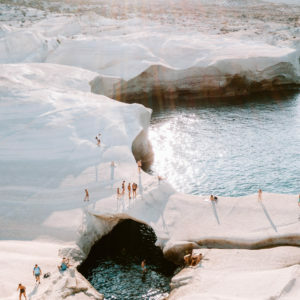 I could easily spend 8 days in Milos! But if you want something totally different, Naxos can offer that. 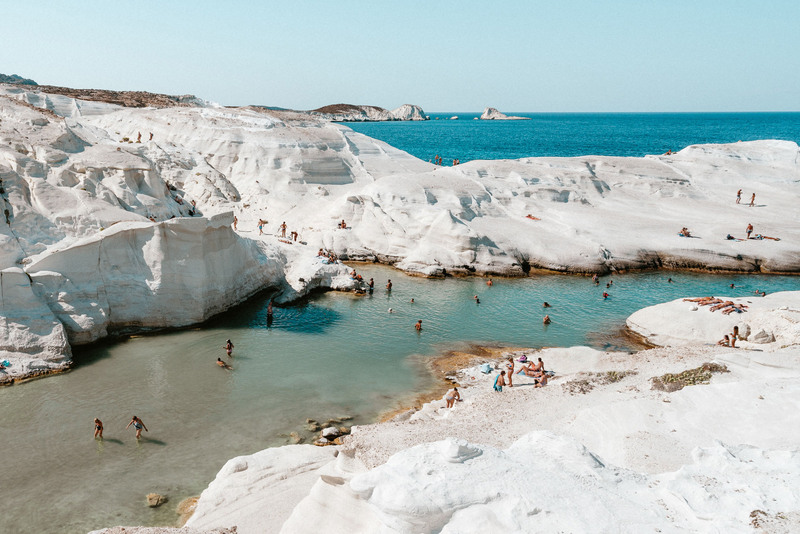 And 4 nights in Milos is definitely enough to see plenty of beaches – especially if you’re hitting two a day (and really, it’s just beach, sleep, repeat!). If I were you, I’d do both if you want to have a more active schedule, and only one if you just want to relax. Hope that helps! Selena, thank you so much for responding! I was so excited you wrote back! My husband and I went to Santorini 10 years ago and spent 5 nights there. We spent every day exploring the island and beaches on our scooter and then meandering through towns in the evenings. It felt like home for the week and we loved it so much! That is pretty much what I have in mind for Milos. Does it have cute towns to walk around and explore? Do the towns of Naxos offer something more unique/special over Milos? Or does Milos also have charming towns with good restaurants to sit at for hours? Thank you so much for your help! I will let you know what we end up doing. Congratulations on your place in NYC, how exciting to live in and experience different cities like you have! 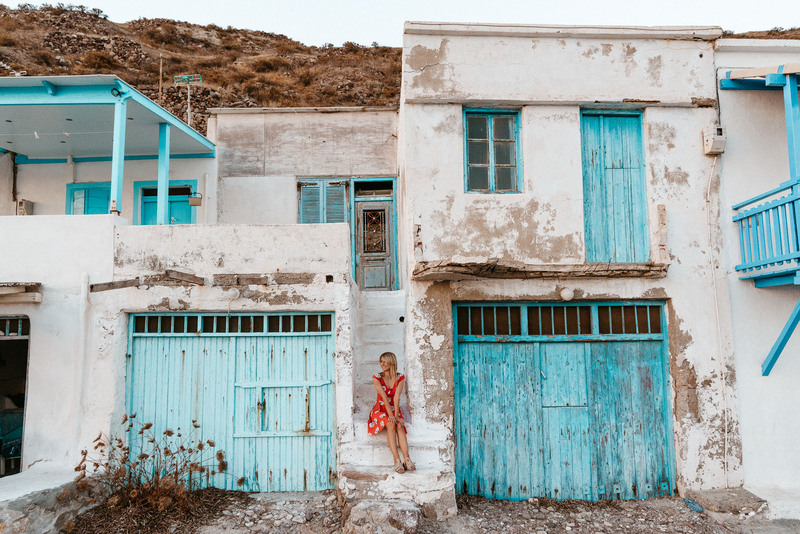 Milos definitely has cute towns to walk around at and explore! And sit down for hours at. 🙂 We loved having our hotel near Pollonia since it’s on the beach. 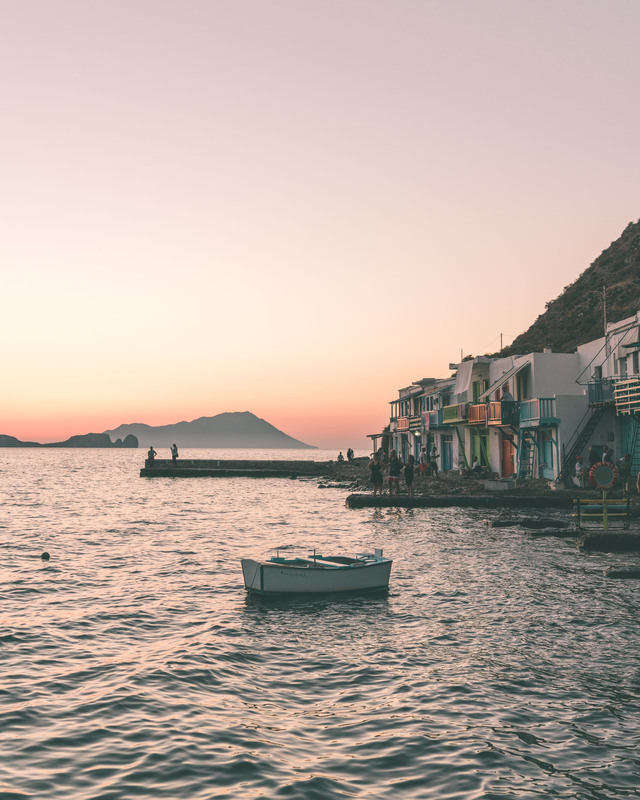 Adamantas is next to the port and is fun to walk around, and Trypiti and and Plaka are both so picturesque and perfect for lunch or dinner. Naxos is unique because it has lots of mountain towns in addition to the picturesque main town on the port. When you’re driving the island it’s easy to forget you’re on an island – you can kind of get lost in the hills (which has it’s own perks!). I found there to be less tourists as well, but it could’ve been more due to the time of year we went (mid-September). Hope that helps. 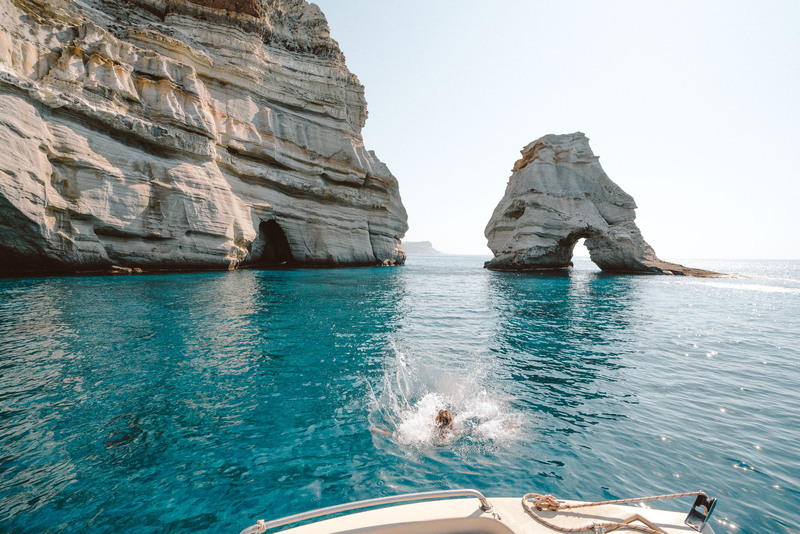 Have the best time…Greece never gets old! This is Wonderful! Greece is a very popular place for holidays. 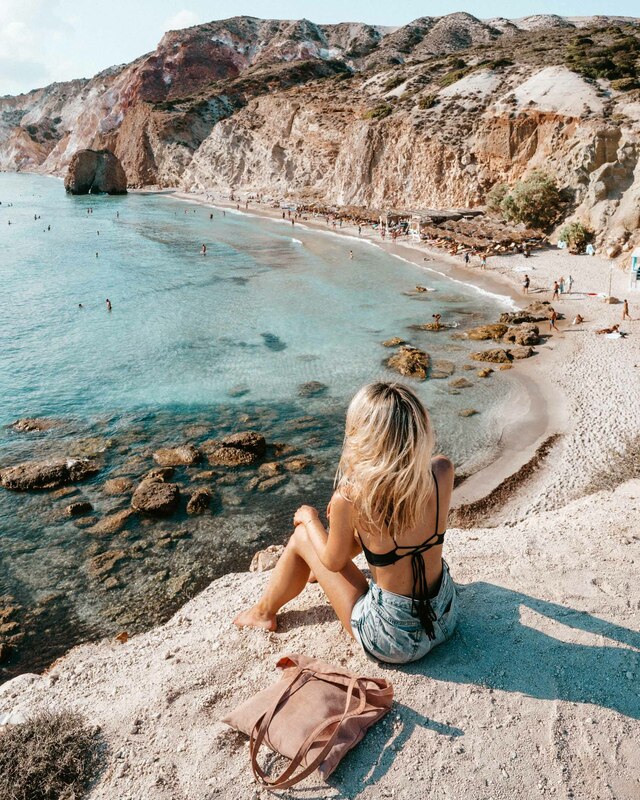 The best time to visit Greece is between May and October. Especially that is the best time to visit I think so….i have to plan next month. Hello! So glad I found your blog. 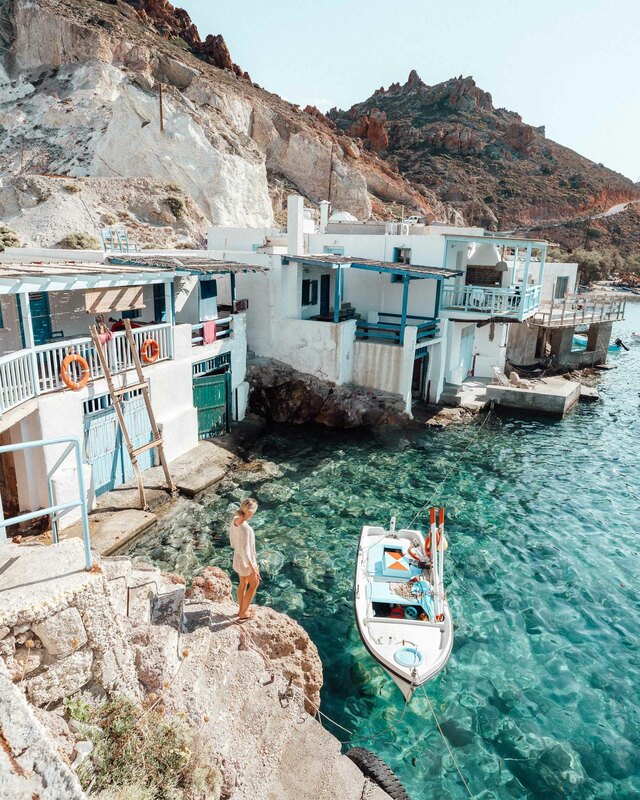 My husband and I are trying to plan a short Greece trip and are torn between doing Rhodes and Symi together or just camping out at Milos and maybe visiting Santorini. Any tips on deciding?! 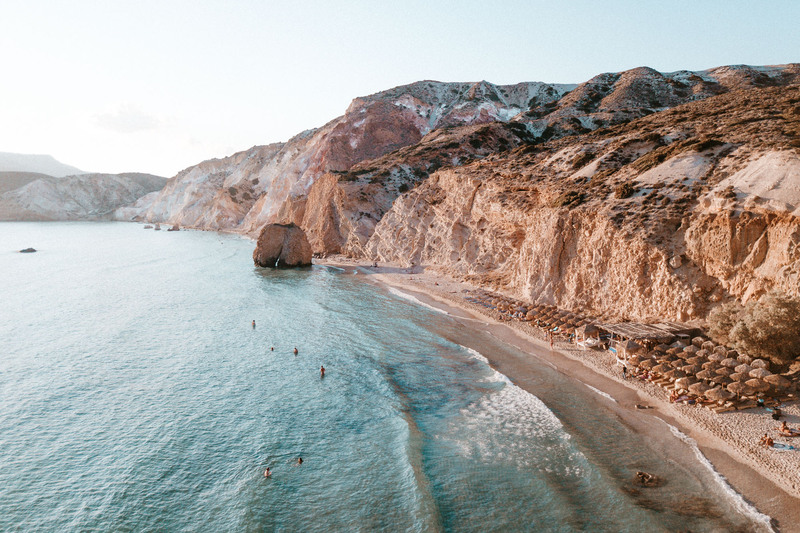 So glad you found me too 🙂 That’s a tough one – I’ve heard great things about Rhodes (and Symi! ), but personally haven’t been to either of them. So I can only comment on Milos. 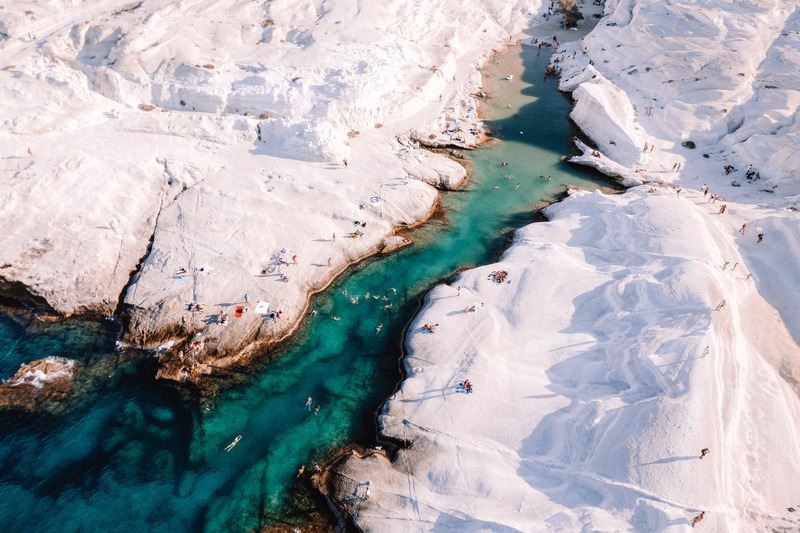 I’d say if you’re in it mainly for the beaches, Milos has the most diverse beaches of any island I’ve been to. Santorini is the opposite as the beaches are mostly rocky and not very swimmable. But, Oia in Santorini is breathtaking and worth a visit alone as it’s one of the most picturesque places I’ve ever been. Note that – it’s also quite crowded! Hi Selena! Thank you so much for the advice about Milos. 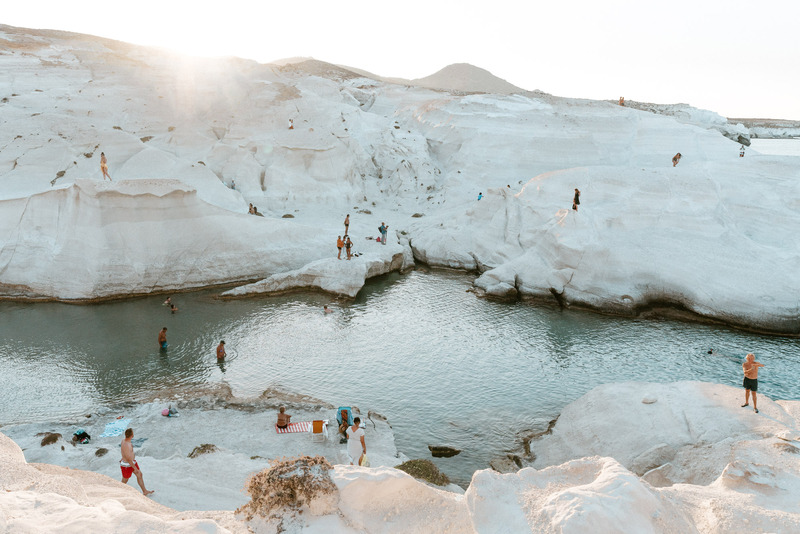 We decided to add two nights to our time in Turkey and spend 6 nights in Milos. We are so excited! Thank you for helping me discover such a cool place! That sounds amazing! Have the best time – and send me a DM on Insta @finduslost so I can see your Turkey pics (we still haven’t made it there!). Hey Ariana! There are taxis but you will likely need to arrange them beforehand whenever you need a ride, so I wouldn’t recommend it as a main form of transportation. We rented ATVs which was great for getting around, you can use them on all the roads around the island. There’s also the option to rent a car or motorbike. Yay! Thanks so much! When will your full guides to Paros and Naxos be out? Can’t wait to read them!